In the summer of 2017, me and my wife visited the ES amateur radio summer camp in Merelaiu (https://www.youtube.com/watch?v=4Cc67GwVYhc). Besides being a beautiful spot in Estonia, it was also a good place to reconnect with all the fellow hams from ERAÜ and I must say I have enjoyed chatting with every single person I’ve met there. It was almost a small talk between me and Tonno ES5TV, who said his superstation is open to opportunities to host young amateurs from Lithuania, whether it’s a big or a small contest. 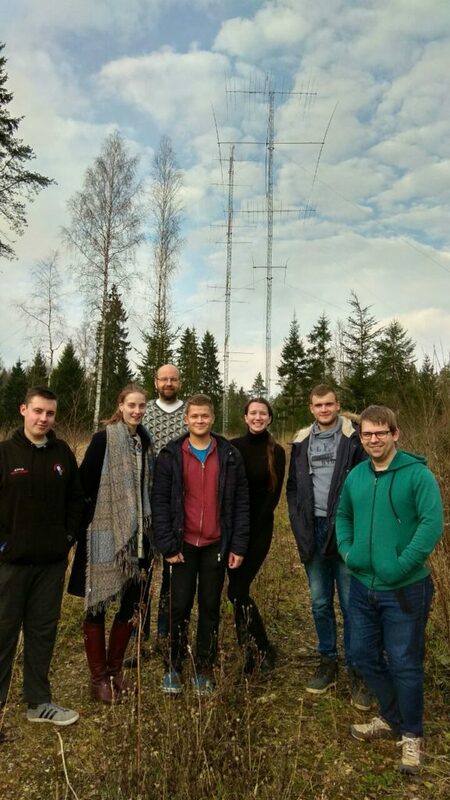 But big names like Tonno talk big and just few months later I was already discussing trip details both with himself and the young members of the Vilnius University amateur radio club LY1BWB, where almost every active member was a YOTA kid. As the summer went by, some of the young contestants had serious plans for the CQ WW SSB, therefore I did not want to interfere neither with them or with the plans of the superstation itself. But the following weekend seemed attractive: Ukrainian DX Contest, Multi-OP ALL MIXED category, no limitations on band or mode changes, one signal at the time – sounded exactly like fun to me and others who had previous contesting experience at LY4A, LY2W and elsewhere. It was a first visit to Tonno’s site for all, including myself. The few who declined, had visited ES5TV earlier, during the YOTA summer camp of 2013. Finally, a total of eight people signed off the trip, including my wife, who, not being directly involved in the hobby, took the delicious initiative of managing the kitchen’s businesses during the contest. We drove to Estonia ham-style, with VHF radios and APRS on, reaching the site just a couple of minutes into Saturday. The call signs brought in were LY1KB, LY5AT, LY5WB, LY3EU, LY1WS and LY2EN. 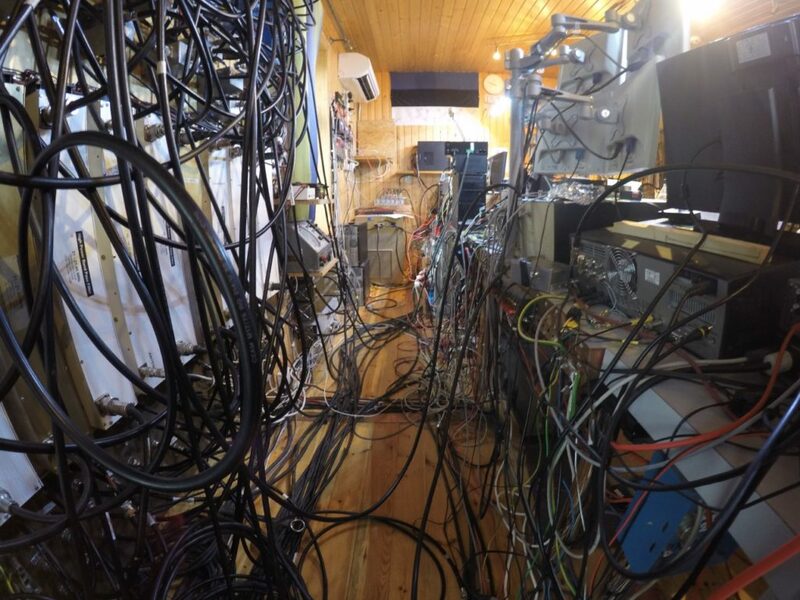 My first impression of the station was jaws dropped on the floor, without yet actually understanding all the switches and connections between the numerous pieces of equipment. In the early hours of Saturday, some took the chance to make a morning escape to the Tartu science centre – AHHAA. Not only I had to understand how the station ensemble works from an intense briefing by Toomas ES5RY, but also had to translate it to the the rest of team later. But in the end it was clear. No switching of antennas during transmissions. Patience, when multiplier position blocks you. Do not sit silently if you notice some equipment is broken or misbehaving – shout it out loud! 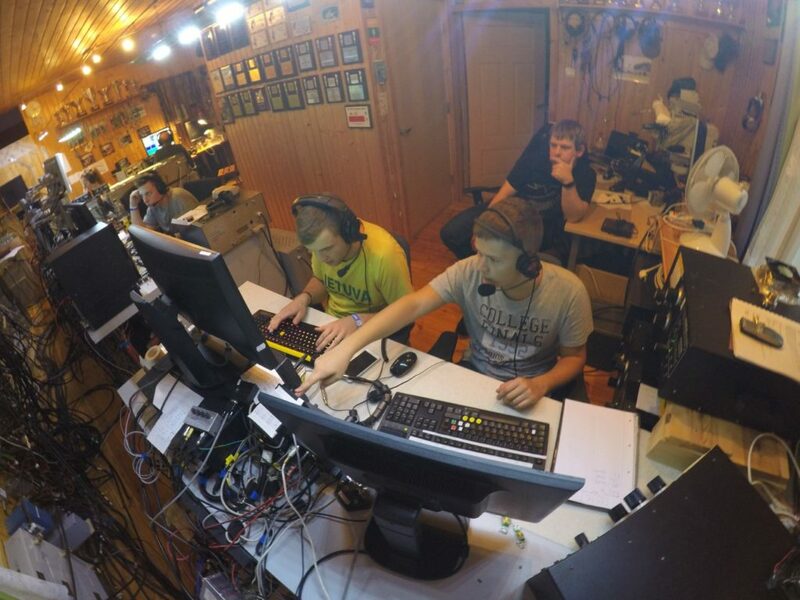 It was still an ongoing discussion and testing of things around 12:00 UTC when the contest kicked in with full force. Two operators were caught in heavy pileups and QRM on the run position; initially a bit cumbersome, double operation went smoother and smoother as the contest shifted gears. ES9C TEST! On the in-band position, Jüri ES5JR was calmly fishing for CW callers, while the guys at run were interchangeably operating SSB. There was not much of resting for others; socializing and storytelling was second to observing and trying to understand how to unlock the true power of the superstation with a small switch at the run position or a hidden pedal at the in-band. As the contest progressed, seats were switched, stomachs got empty. 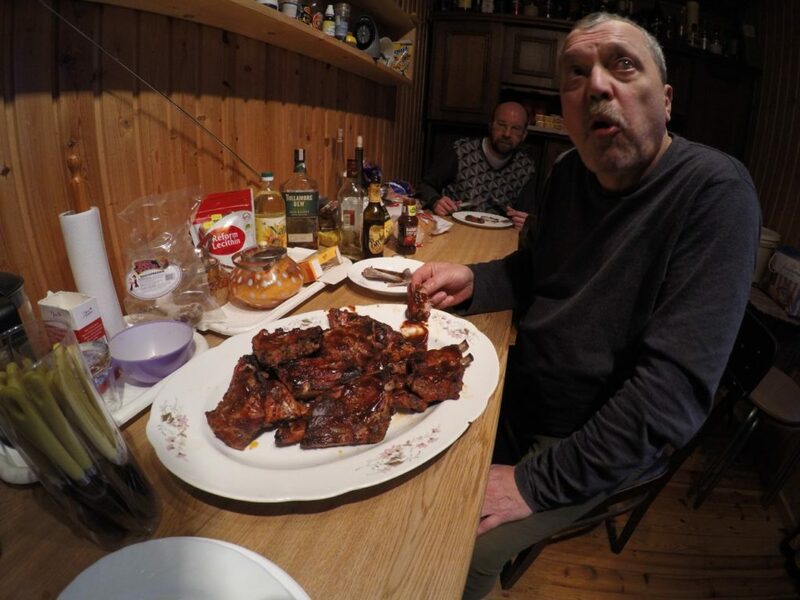 To mitigate the latter, almost 10 kilos of pork ribs were waiting to test out the kitchen shack of ES5TV. My wife took command and the ribs were such a success that the contest almost had to pause. Some photo evidence survived, clearly displaying Toomas ES5RY praising the final outcome. Night time was low band time and 160 meters turned out to be the most valuable multiplier band, an average of more than 5 points for QSO. 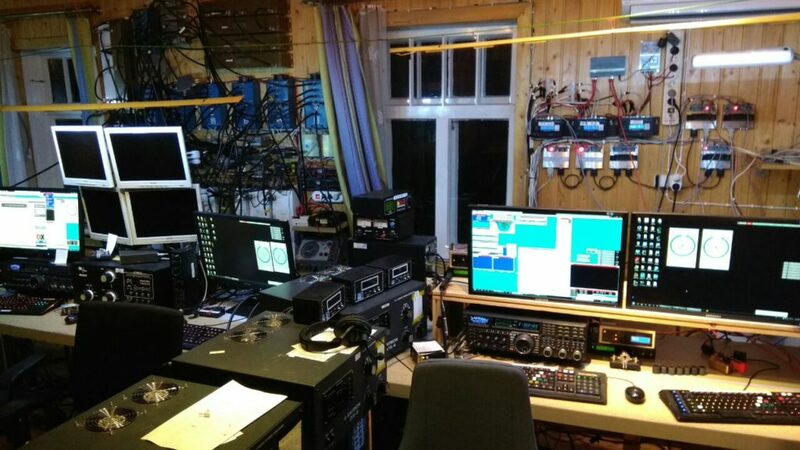 Linas LY5AT made his first and valuable CW QSO’s – chasing multipliers with assistance was not rocket science and, hopefully, a little push and promise to future self to become proficient in CW. We have finished the contest with almost 2,6M points and all except five Ukrainian oblasts in the log. There were no empty chairs throughout the night and enjoyable openings on 20 meter band in the morning. On 15 meters, nobody was a match to the famous double-H tower, pictured below. The only thing we have lacked was good 10 meter propagation and enough sleep. In my own experience, I rarely participate in contests alone. Teamwork and smooth cooperation to me are essential parts of amateur radio contesting. But overall enjoyment of it, all the positive emotions you get from humming crowds, waiting for your call, is extremely important. Some amateurs might find contesting stressful just because of reasons; they might think they can’t keep up with the results of the experienced, drag the team behind, but guys, that is not how cooperation works. My view here – no matter what your capabilities, set your attitude to positive and you will always get better results from everything you do – and contesting at large is no exception.